What Are Perversions? questions above all what we mean when we use the term “perversion.”Are we dealing with a sexological classification, a mental disturbance, an ethical deviation, a hedonistic style, or a historical-cultural artifact? The book retraces some of the fundamental stages in the field of psychoanalytic thought -- from Freud to Masud Khan, Stoller and Lacan -- and propose an original approach: that “paraphilias” today are taken as an ethical failure of the sexual relationship with the other. The perversions signal a specific relationship with the other, who is treated not simply as a sexual object, but someone whose subjectivity is ably exploited precisely in order to get a perverse pleasure. Acts, if considered perverse, are understood as a metaphorical re-edition of a trauma, above all sexual, in which the subject (as a child) suffered the bitter experience of exclusion or jealousy. The book articulates a heterodox hypothesis by drawing on clinical cases, from both the author’s own analytic practice and those of others; but it also draw on cinema, historical episodes, social psychology experiments (for example, Stanley Milgram’s experiment), stories and novels, and philosophical works. The final appendix delves more deeply into Freud’s theory of masochism. Dr. Benvenuto will be joined by panelists from IPTAR, The Candidate Journal and Das Unbehagen: Drs. Aleksandra Wagner, Sam Semper, Emma Lieber, and Anna Fishzon for a discussion of the topics and controversies raised in his book. * Arrive early and join us for a wine and cheese reception at 7:30pm, IPTAR Conference Room, 1651 Third Avenue, suite 205 (between 92nd and 93rd streets) This event is free and open to all. 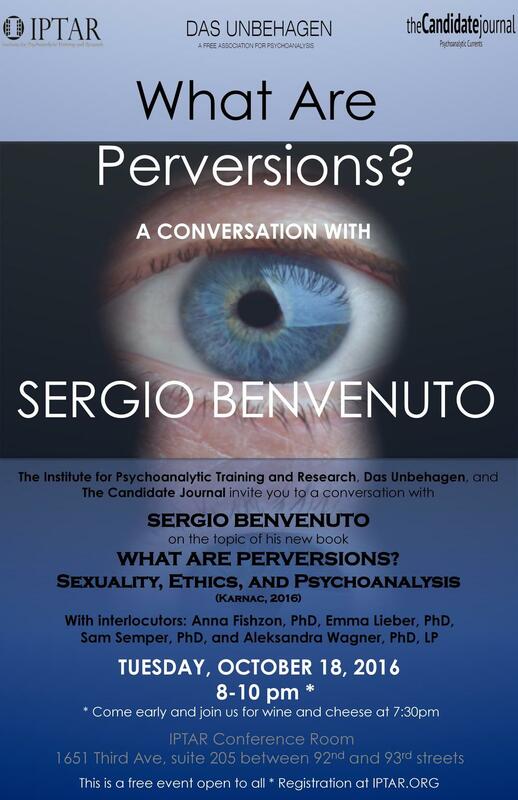 Sergio Benvenuto is a psychoanalyst and a researcher in psychology and philosophy at the National Research Council (CNR) in Rome. He is editor of the European Journal of Psychoanalysis and member of the Editorial Board of Psychoanalytic Discourse (PSYAD). He has contributed to Lettre Internationale, Texte, Journal for Lacanian Studies, L’évolution psychiatrique, American Imago, and Telos. Among his most recent books in Italian: Lacan, oggi [Lacan, Today] (Mimesis, 2014).